I work at home because it’s the only way I can get a window seat. Lately, I’ve been keeping an eye on neighborhood vagrants. It doesn’t look good. My window looks upon an empty house; empty except for the furry creatures underneath. There are over 1,500 species of rodents on earth, and I think most of those live next door. A few years ago, a squirrel steadily emptied a neighboring attic of its pink Corning fiberglass insulation and built a hideous nest on my roof. I could hear every time it dropped from the adjacent pine tree onto my house. For the past month, alongside my chimney, I find daily deposits of chewed wood and masonry, and sometimes yellow insulation. Varmints getting ready for winter, alright. Or maybe something else. 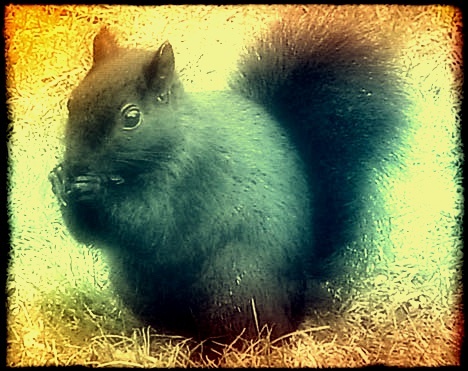 Yesterday I saw a mohawked black squirrel, piercings glinting in the sun, shake down an unsuspecting cat. The cat had previously been dragged across the lawn, its jaws clamped on a crow’s foot, but it wanted nothing to do with a badass squirrel. I don’t blame it. Today I let out my dogs. On the lawn were three squirrels, waiting. Thug squirrels, relaxed and cocky. I didn’t go inside, fearing they might try to carry away one of my 24-pound Cavaliers. The dogs sensed my anxiety and didn’t bark. Good idea – avoid provocation. As I gaze on the house next door, I think I know why it’s not selling. The rodentia have numbers on their side at this point. Who wants to take on that kind of fight? I know the creatures are eying my place, too. After that, who knows? School Board, Town Council. They’re already in, it’s just a matter of time. Nuts and fiberglass for all. Posted in Bits and tagged Humor. Bookmark the permalink.